Everybody loves a bright white smile, and there are a variety of products and procedures available to help you improve the look of yours. Many people are satisfied with the sparkle they get from daily oral hygiene and regular cleanings at your dentist’s office, but if you decide you would like to go beyond this to make your smile look brighter; you should investigate all of your teeth whitening options. will stand out in your newly whitened smile. You may want to investigate other options, like porcelain veneers or dental bonding. This procedure is called chair-side bleaching and usually requires only one office visit. The dentist will apply either a protective gel to your gums or a rubber shield to protect the oral soft tissues. 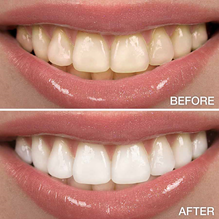 A bleaching agent is then applied to the teeth, and a special light may be used. Involves 6 to 10 top and bottom front teeth; 12 to 20 total. Total number of teeth wanted depends on the presenting conditions. Although the teeth are isolated and soft tissues are protected, it is possible some of the whitening solution can contact the tissues. The tissues may temporarily turn white and be sensitive. This will go away in a few hours at most. Some postoperative colour rebound is possible. Commercial whitening products intended for home use, as the dentist will take an impression of both jaws to fabricate a bleaching trays which cover all top and bottom teeth. These trays are used to hold the bleaching gel against the teeth, and the dentist will handle you the trays and the bleaching gel and tell you the instruction of use at home. This technique can take several weeks to complete. Trays can be kept and used in the future, with only a syringe of whitening gel to “touch up” teeth before important events. Food and drink will yellow teeth over time. This is the fastest, most effective, and best value. The in-office teeth whitening is done in one appointment. At Home, the trays stabilize the colour, reduce rebound, and are available for the future.